The architectural world went through a phase where everything had to be built up, and competitors were trying to outdo one another with who could design and build the tallest structure on earth. It seems the underground homes have completely turned that phase on its head, and people are now asking for their homes to merge with nature, as opposed to clearing way for another structure that may not benefit the environment. A home in Arizona, designed by the architect Rick Joy, has become the first hidden luxury home designed and constructed in a desert. The home is quite literally built into the desert. From the outside one would confuse the roof of this underground home with rusty metal that’s been discarded amongst the sand dunes. On closer inspection one begins to realise the faded and rusty red roof is a facade that covers a sanctuary of pure contemporary design of architectural proportions. The exterior of this underground home looks nothing like a typical luxury home, although it certainly houses many luxurious designs. This underground home blends in with the scenery from the top, and the lower half looks out onto the majestic desert mountains. A porch with an imbedded modern edge-glass pool of crystal clear water is the main feature on this minimalist extension that juts out into the desert. The interior of the home boasts panes of glass that reveal well-lit rooms, a comfortable living area and an environment that draws you in to bond with nature. The design and comfort of this underground home belies its arid surroundings and is a stark contrast to the dry mountainous desert. Rick Joy is known for making his clients homes look like they’re part of the scenery. He takes an eco-friendly approach by using materials that give off the effect of discarded products. These materials are the facade that shelters Rick Joy’s pure design genius. In the case of this underground home, it would work in your favour to scratch the surface. All things considered the idiom of ‘don’t judge a book by its cover,’ jumps to mind, and it couldn’t be more apt that with underground homes designed like this one. 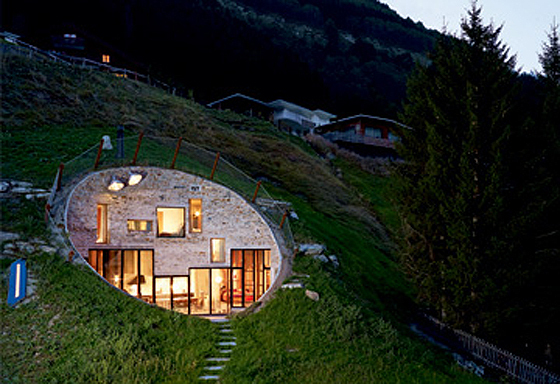 Underground homes are becoming more and more popular and one can see why. This hidden gem is similar to any typical luxury property – with the exception of the fact that it’s underground! Sally Roberts enjoys writing on a wide variety of topics including luxury lifestyles; she prefers to live above the ground in luxury property for rent in Knightsbridge, but she still finds the concept of these underground abodes pretty intriguing!